A rapidly intensifying storm is sending temperatures plummeting by more than 40°F across the western and central Plains on Wednesday, spawning an April blizzard that could dump more than 2 feet of snow in some areas. Why it matters: This storm will paralyze a huge area of real estate and potentially set up beleaguered states such as Nebraska, Iowa, Minnesota and Wisconsin, among others, for more flooding in coming days. It could also set records for snowfall — with the potential for as much as 30 or more inches in parts of the Midwest — and for the lowest atmospheric pressure reading observed during the month of April in particular states. The air pressure reading is significant because the lower the air pressure, the stronger the storm. Remarkably, this bomb cyclone, so named because of its rapid rate of intensification, is following on the heels of another such storm that struck the same general region last month. That event led to billions of dollars of damage, mainly due to widespread flooding that overran a major U.S. Air Force Base outside of Omaha. Details: Wednesday's storm is spreading a smorgasbord of weather hazards, from flash flooding and severe thunderstorms to blizzard conditions, from Colorado to Minnesota and southward to the Gulf Coast. At its peak intensity late Wednesday into Thursday, winds could whip above 60 mph across multiple states from the Great Basin to the Upper Midwest. In some areas, whiteout conditions will render travel impossible, with the National Weather Service warning of life-threatening travel conditions as the storm intensifies rapidly. Heavy, wet snow plus high winds could create long-lasting power outages as well. The heaviest snow looks to fall in eastern South Dakota and western Minnesota, where 24–30 inches is possible, according to the NWS. Some states, like Nebraska, could see severe thunderstorms, heavy rain, icing and blizzard conditions at the same time. Thundersnow has already been observed in South Dakota as the storm gets underway there. Blizzard warnings are in effect for 6 states, and whiteout conditions could shut portions of interstates 70, 80 and 90, as snow drifts pile up several feet high. April snowfall records and possibly even all-time snowfall milestones could be set in parts of the Plains. 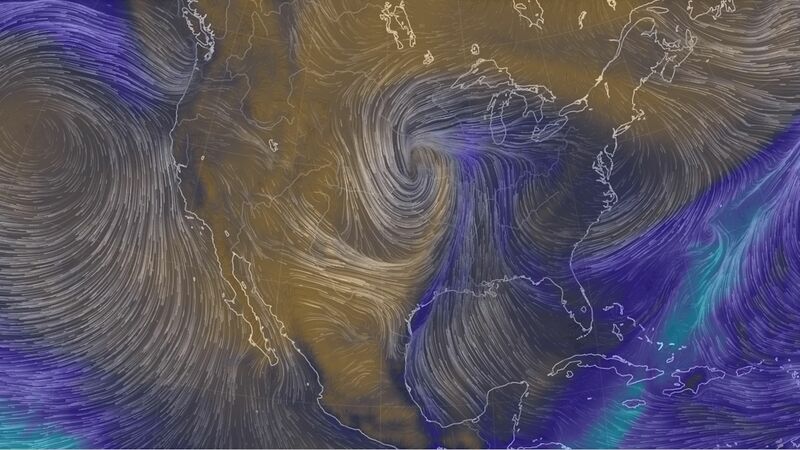 Between the lines: It's not unusual to see powerful low pressure systems erupt in the central U.S. during April, given the clash between winter and spring air masses at this time of year. However, a low pressure area that intensifies at least 24 millibars within 24 hours, occurring so soon after a similar storm broke low pressure records, is noteworthy, though is not assured in this case. This event is forecast to be about 3–4 standard deviations below average, when it comes to surface pressure, which is indicative of a particularly powerful storm. It's conceivable that an April low pressure record will be set in Kansas as the low pressure center pinwheels across that state. What's next: The big concern after this storm departs will be the snowmelt from whatever snowpack it deposits, as well as any rain water runoff that could send already high rivers and streams back over their banks. The NWS has already warned of the likelihood for a potentially devastating spring flood season in the Midwest and Mississippi River Valley, and this storm is the type of event that forecasters have feared. Be smart: Although the blizzard conditions will only hit a select few states, millions will be affected by this storm as it will kick up strong winds and raise wildfire risks from the Southwest to the Great Lakes. Air travel at multiple hubs, including Denver, Chicago, Minneapolis and even Dallas, is likely to be hit with weather-related delays related to either heavy snow, strong winds, thunderstorms or a combination of these threats through early Thursday.